This is a chance to win a 3D2N trip for 2 to Sagada or roundtrip Victory Liner tickets to Baguio! Just follow @survivingsagada then submit a link through their Twitter of your online essay/poster/video/slideshow (or create anything) telling them why you'd like to go to Sagada. Don't forget to tag them and add #survivingsagadacontest to your entry! They will be giving 2 more trips so the deadline for submissions are April 28, 2013 and May 29, 2013! 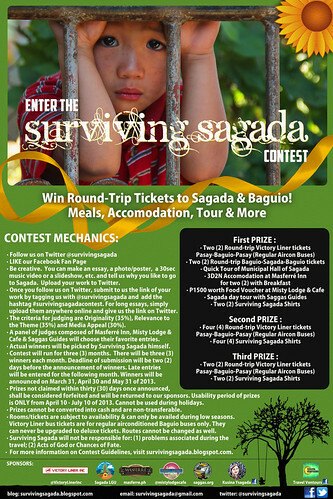 Click here to join the Surviving Sagada Tour Contest.